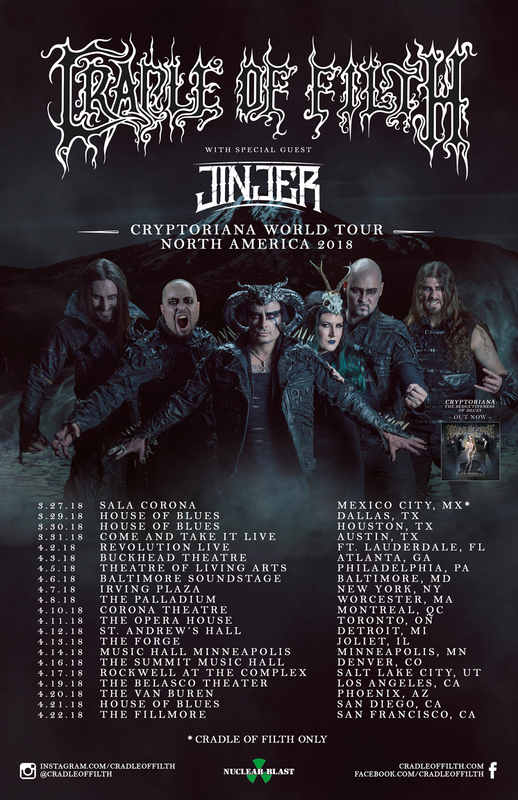 Cradle Of Filth have announced a new north american tour titled the "Cryptoriana World Tour North America 2018". Support will be coming from the Ukraine based band JINJER who have quickly become one the most talked about names in the heavy metal landscape today. Since the release of their Napalm Records debut "King Of Everything", they have kept a steady touring schedule including a main support slot on ARCH ENEMY's Eastern European tour and more recently a very successful headline run of the United Kingdom. Already setting their sights on 2018, JINJER have just announced a North American tour as special guests for CRADLE OF FILTH! This marks the JINJER's first time playing on North American soil. 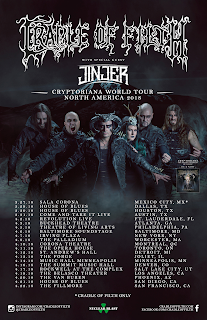 Eugene, bassist for JINJER had this to say: We're not only excited about playing North America for the first time EVER but also about touring with legends Cradle Of Filth, whom we grew up listening to and have a lot of respect for. Being able to watch them every night and throw down to new crowds is like a dream come true. Our fans have asked us many times to tour there and it feels great to finally give them a chance to catch us live!